You can never have too many good cookie recipes in your repertoire right? 2. Beat the sugar and vanilla into the butter. 3. Beat the eggs in. 4. Sieve the flour, baking soda, and salt and stir into the mixture. 6. Stir the chocolate into the cookie mixture. 7. Use an ice-cream scoop to dollop rounds of cookie mixture onto prepared baking trays (either greased or lined with baking paper). Leave plenty of space for them to spread out during cooking. Makes 15 cookies – I did 5 each on three baking trays. 8. Bake in preheated oven at 170C, 330F for about 15 minutes until they are starting to brown at the edges. 9. Transfer to racks to cool. Thank you, I was pleased with how they came out! I like when cookies come out kind of uneven shaped and bumpy like that! I was also thinking it could be nice to use almond essence instead of the vanilla essence to compliment the almonds in the chocolate. Good idea. Nice to complement the almonds. I can smell them now. Oh yes, complement not compliment! About all I can say to this is … yum! It sounds like my kind of cookie! Should the chocolate bar be dark or milk chocolate? I’m guessing dark. Yes, I like big soft cookies with chocolate in! I used milk chocolate (I know it looks quite dark on the picture), but really whatever your preference. 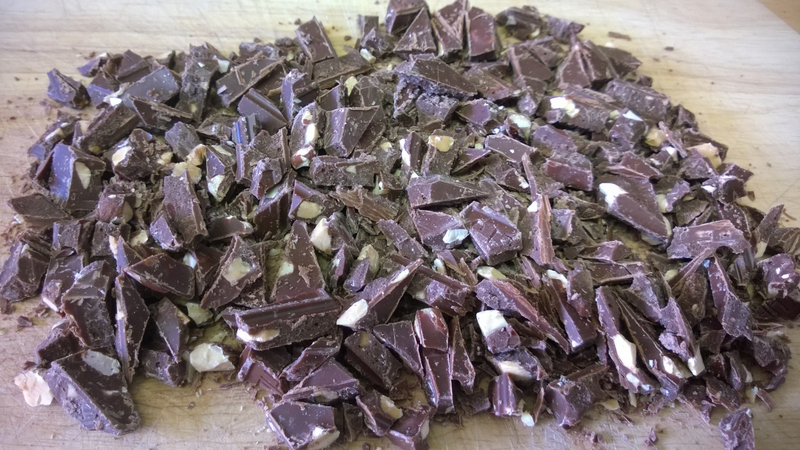 I know, what’s not to like about chocolate and almonds right? Oh my, I’m drooling all over the couch. These look divine. Haha, you drooling all over the couch is making me laugh a lot! Gosh! Great bake you have there! It’s so brilliant! 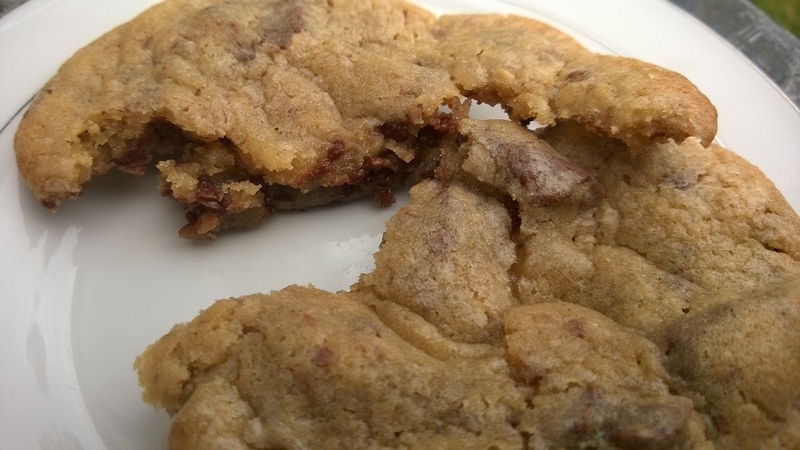 Thank you – I sometimes have a tendency to overbake cookies, but luckily not on this occasion! No, I’m the cookie KING! Yummy! I prefer dark chocolate with almonds for some reason, but I bet milk chocolate would be just as delish! Either way – I tend to prefer milk chocolate in general but I wouldn’t turn down dark!